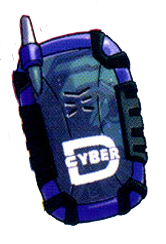 For the toy of the same name, see Digital Monster D-Cyber. The D-Cyber Digivice is the equivalent of the Digimon Pendulum X. Can be used to evolve a digimon. The Digital Monster D-Cyber is the Bandai Asia equivalent of the Digimon Pendulum X line of toys. It comes in a variety of colors and special editions, usually accompanied by a phone strap and trading card. This page was last modified on 18 January 2019, at 20:19.